Not only it increases your productivity by adding tab it also provides you to navigate easily among different directories. The Chrome-style tabs are perfectly integrated into the visual interface and don’t add any unwanted clutter. They are also consistent with keyboard shortcut behaviour of browsers. You can press ⌘T to open new tabs and ⌘W to close them, rearrange them via drag and drop and easily transfer files between them. Also, ⌘N still brings up a new window and Spacebar still launches Quick Look so your old keyboard shortcut habits will still function just fine. Together with Tab feature it also has some other features. 1. Dual Mode (⌘U) It can seen as an extension to tab feature, giving you side-by-side views of two spaces simultaneously. It's like having two tabs open in one space. Dual mode's biggest asset is it enables easier dragging and dropping of files and folders. It's also useful if you typically have more than one Finder window open at once, like if you typically have open one local folder and a second shared folder on a server. 2. Folders on Top It shows folders on top at each of Finder and rest of files follows them. It can be viewed as 'sort by kind' option in windows. 3. Show System Files It allows you to see all the files on the system which comes pretty handy when you are dealing with system files. 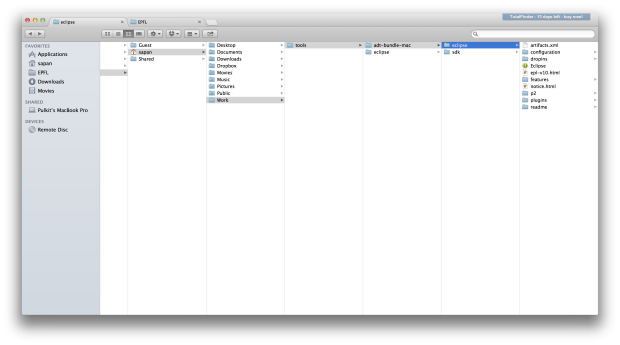 By default you don't see all the files in Finder window. 4. Cut & Paste Use keyboard shortcuts to move files around. Faster than drag & drop. Feel free to add more features if I missed something. For more information Visit http://totalfinder.binaryage.com.